Restaurants across Washington, D.C. will donate a portion of their proceeds to organizations that help victims of Hurricane Harvey and the devastating flooding that has followed. D.C. Dines Out for Houston, a project of the Restaurant Association of Metropolitan Washington, is Thursday. Participating restaurants will donate 1 to 5 percent of their proceeds to organizations helping flood victims. Dozens of D.C. restaurants have signed up for the day of fundraising, including Busboys and Poets, which has six locations in the Washington area, Tryst on 18th Street NW and Open City on Calvert Street NW. "I think it's incredible for anyone to step up and do what they can to create change. Kudos to business owners and individuals who can make a difference," one customer of Busboys and Poets said. 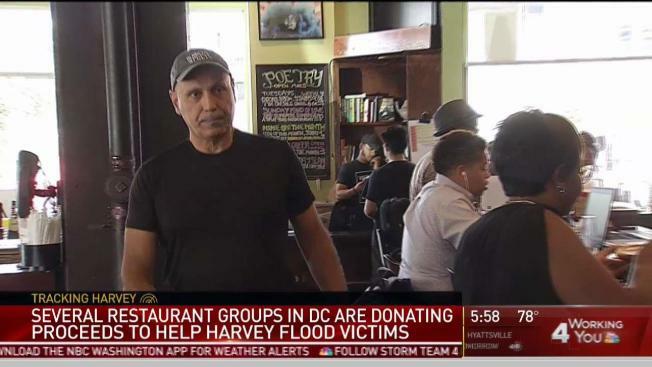 Andy Shallal, the owner of Busboys and Poets, said he was moved to help after he saw "people losing everything." "These are people in our own backyard," he continued. Busboys and Poets plans to donate 5 percent of the day's proceeds to #HarveyRelief. Beefsteak, Oyamel, Jaleo Bethesda and Jaleo Crystal City also will donate 5 percent of their proceeds. To see the full list of restaurants donating a portion of their proceeds to help flood victims, go here.